Points of Interest: The Sugar River, Avon Bottoms Wildlife Area, Avon Bottoms State Natural Area (which is within the Wildlife Area). In Rock County; two county parks: Avon Park, Sugar River Park and a road marker for the Halfway Tree. In Green County; Clarence Bridge County Park, Rustic Road No. 90. Water Quality: OK Creek impaired, 303d listed for phosphorus. See section Did You Know? below. 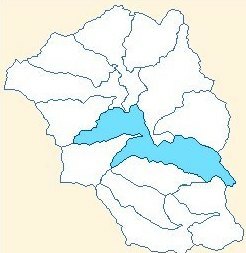 The OK Creek/Sugar River Subwatershed encompasses the Sugar River from just north of Highway 11/81 to the Wisconsin/Illinois State line. A very small portion of the watershed falls south of the Illinois border. The portion of the subwatershed that is northeast of the Sugar River is drained by unnamed streams. To the west of the Sugar River, a wedge shaped section is drained by the Lower Unnamed 01 channel. A larger wedge shaped section above that is drained by the OK Creek. Both of these streams have been extensively ditched to drain and convert wetlands to farmland. Eleven acres of marshland still exist adjacent to OK Creek. Most of the Avon Bottoms Natural Wildlife Area is within this subwatershed. A small section of the Wildlife Area, including the Swenson Wet Prairie Natural Area, is in the Taylor Creek Subwatershed. The Sugar River Master Plan, published in 2016 by an interdisciplinary state planning group, provides guidance for recreation and habitat management of over 14,000 acres of designated land (which includes the Avon Bottoms Wildlife Area). The Wisconsin Wetland Association has identified 100 areas in Wisconsin as Wetland Gems. These areas represent various high quality wetland types (marshes, bogs, fens, etc) which support biodiversity and serve roles in flood control, water quality, fish and wildlife habitat. One such area is the flood plain forest along the Sugar River, from Brodhead to the Illinois border. The Wetland Gem fact sheet describes the area’s significance, ecology, flora, fauna and current threats, such as invasive species. For more information about protection, restoration, and enjoyment of Wisconsin’s wetlands, visit Wisconsin Wetland Association.org. The OK Creek/Sugar River Subwatershed is home to the Spring Grove Dairy, a 2,000 head dairy cow concentrated animal feeding operation, situated along County Road G, which has been in operation since 1999. A Concentrated Animal Feeding Operation (CAFO) is defined as a large animal feeding operation, which raises and feeds animals in a confined space for more than 45 days in a year. Seven hundred dairy cows comprise a CAFO. The numbers vary for turkeys, chickens, swine and beef cattle. Confining a large number of animals in a small area creates potential environmental impacts. These include surface water, ground water, and wetland quality and air quality. CAFOs are regulated by the Environmental Protection Agency (EPA) under the Clean Water Acts of 2003 and 2008. In addition, in Wisconsin, CAFOs are permitted through the Wisconsin Department of Natural Resources (WDNR), which defines agricultural performance standards, manure management prohibitions and requirements to control runoff from fields, pastures and facilities. The number of CAFOs in Wisconsin is increasing, with over 200 CAFO permits active in 2014, the majority being dairy operations. In 2016, Green County had three active permits for dairy CAFOs and Rock County one active dairy permit (2014 data). Recreational activities abound in this subwatershed, with its County Parks, Natural and Wildlife Areas, and access to the Sugar River. Canoeing, boating, fishing, birding, hunting and trapping and other low impact recreational activities can be pursued. Both the Green and Rock County parks provide limited services. Clarence Bridge Park offers a boat launch, picnic tables, and an outhouse, and allows camping, along with a supply of catfish in the river. Sugar River Park provides only parking space and an unimproved boat ramp for canoes. The 17 acres of Avon Park are completely undeveloped. The Avon Bottoms Wildlife Area provides 2,835 acres along the Sugar River for public enjoyment. The Wisconsin Department of Natural Resources (WDNR) manages wildlife areas to “sustain the wildlife and natural communities found on the properties and to provide a full range of traditional outdoor recreational uses” (Wild Life, 2016). Included within the wildlife area are 1,649 acres which are set aside as the Avon Bottoms State Natural Area (SNA). The primary goal of the SNA is to protect rare and intact native plants or animals. 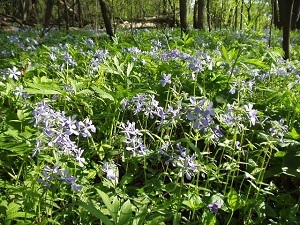 The floodplain and wet prairie areas of Avon Bottoms contain diverse species of trees, shrubs, grasses and wildflowers. The oxbow lakes are home to unusual reptiles, amphibians and invertebrates. Both wildlife and state natural areas allow the public to engage in low impact and traditional recreation. The Avon Bottoms in particular is desirable for birding, being designated a “Wisconsin Important Bird Area.” Many migrating birds pass through this flood plain. Cerulean and Yellow-throated warbler, Acadian Flycatcher, and Yellow-crowned night-heron all breed in the Avon Bottoms. Additional activities include hunting (especially for waterfowl, deer, and stocked pheasant), trapping, wild edible gathering, and wildlife viewing. The Sugar River provides fishing opportunities for northern pike, walleye, largemouth and smallmouth bass, catfish and pan fish. Though there are no designated trails, cross country skiing, hiking, and biking, are permitted activities. Of course, canoeing the Sugar River is a popular pastime. Canoeists can access the Sugar River at Clarence Bridge Park, Beloit/Newark Road, and the Sugar River Park on Nelson Road. From Beloit/Newark Road, the river becomes more swampy until it reaches Illinois. Avon Bottoms is densely wooded lowland with some areas of deadfall, providing paddlers with a feeling of remoteness and some challenges. Mike Svob, in Paddling Southern Wisconsin, describes canoeing from Decatur Lake to the Avon Bottoms. 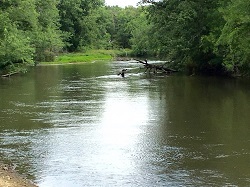 A Lower Sugar River Watershed (LSRWA) member chronicled her canoe trip, a four mile stretch from Beloit/Newark to Nelson Road, on the LSRWA website. For a pleasant road trip through this subwatershed, start just south of Brodhead by viewing the historically significant Halfway Tree, just south of the Brodhead airport. A road marker sign states, “This bur oak marks the halfway point between Lake Michigan and the Mississippi River. Paced off by Indian runners and confirmed by the U.S. Survey in 1832.” To find the tree, drive south on Airport Rd. and turn west at the juncture with Halfway Tree Rd. Less than a quarter of a mile down Halfway Tree Rd., you will see the road marker sign. The stately tree, with an 11 foot circumference, is visible 300 yards south of the road on privately owned land. From the Halfway Tree, head about two miles west to Ten Eyck Orchard. Six generations of the same family have owned and operated this orchard since 1839, which offers 50 varieties of apples. 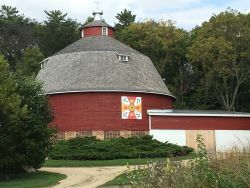 Their round barn, located just west of the Sugar River on the north side of Hwy 11-81 is a local landmark. Continue west on Hwy. 11-81, then south on County Road G to Kaderly Rd., and follow the directions for a drive through Rustic Road (No.90) a quaint, 3 mile stretch of tree-lined, unpaved roads which includes portions of Preston, Mill, and Kaderly Roads. For a completely different kind of recreational experience, the Sugar River Raceway, located just west of the Sugar River and south of Hwy 11/81, provides serious go-kart racing. The Village of Avon was established in Avon Township in the 1840s, near the east bank of the Sugar River, with hopes of becoming a thriving community. At its peak, with a population of 400, Avon boasted a number of shops, a cheese factory, pump factory, sawmill, grist mill, two churches, post office and school. However, the anticipated railroad bypassed Avon, instead going through Brodhead to the north. Today, this unincorporated community has dwindled to 50 persons and no businesses, industry or churches. OK Creek was added to the 2016 Wisconsin Department of Natural Resources (WDNR) 303(d) proposed impaired waters list. The concerns, which are assigned a medium priority, are degraded habitat due to non-point source sediment and total suspended solids and degraded biological community due to total phosphorus. For a printable PDF map of Ok Creek - Sugar River Subwatershed click here.